More versatile than just for dressing up. If you've been a reader of Primer for any length of time, then you know how much we love a great sweater. It's the perfect layering device to add texture, depth, and visual interest to any outfit, and of course, they're really warm too. We're especially fond of sweaters that add thickness to the neck, be it a shawl collar cardigan, moc-neck, or a rolled shawl collar like this handsome lambswool number by J.Crew Factory. It's easy to see a sweater like this sitting on a store shelf and relegate its usefulness to only more dressy events. And while it works fantastically for that, as we'll make the case for below, this type of sweater can also be worn for all levels of dress, with a tie all the way down to… sweatpants? Heck yeah. If you're not familiar with J.Crew Factory you may assume it's where irregular items from the flagship store go to be gobbled up by outlet go-ers who don't mind buying shirts with crooked collars. 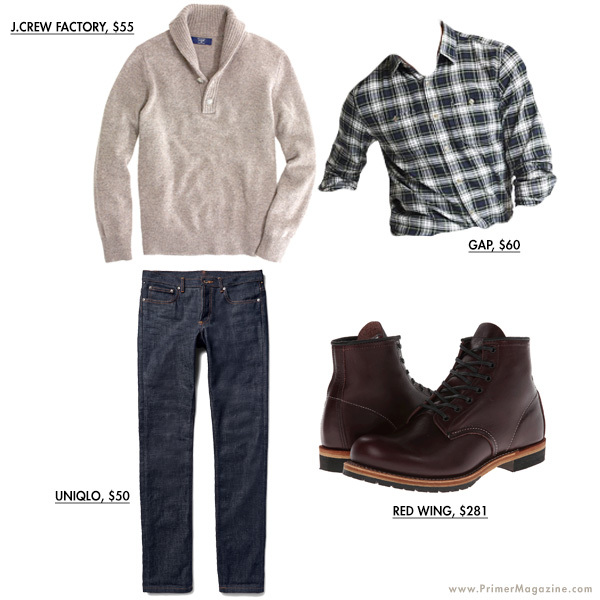 But it's actually one of the best kept secrets for affordable men's style. With similar styling of its full-priced older brother and price tags equivalent to full-priced Old Navy items, J.Crew Factory is a separate line, not old stock. 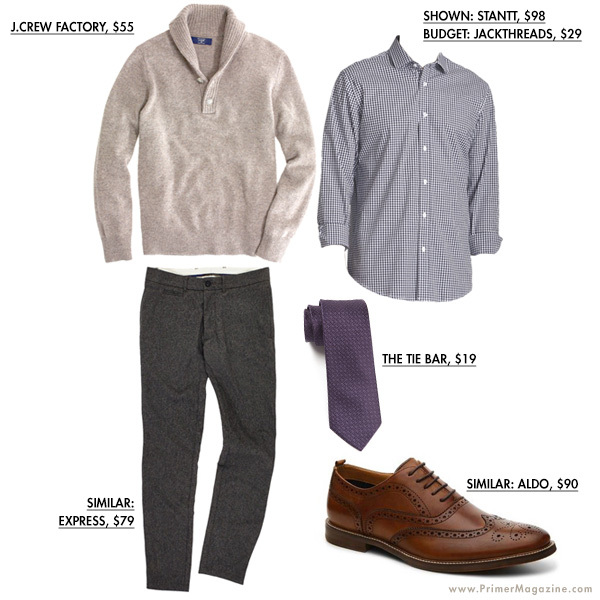 And with quality similar to that of Gap, it makes purchases like affordable suits or our featured lambswool sweater a no-brainer for guys who like great style on a budget. While currently not on sale as of publishing, (bummer) it was all the way down to $40 last week – and as you'll see with the wide range of looks below that's a price to versatility ratio that makes damn good sense. 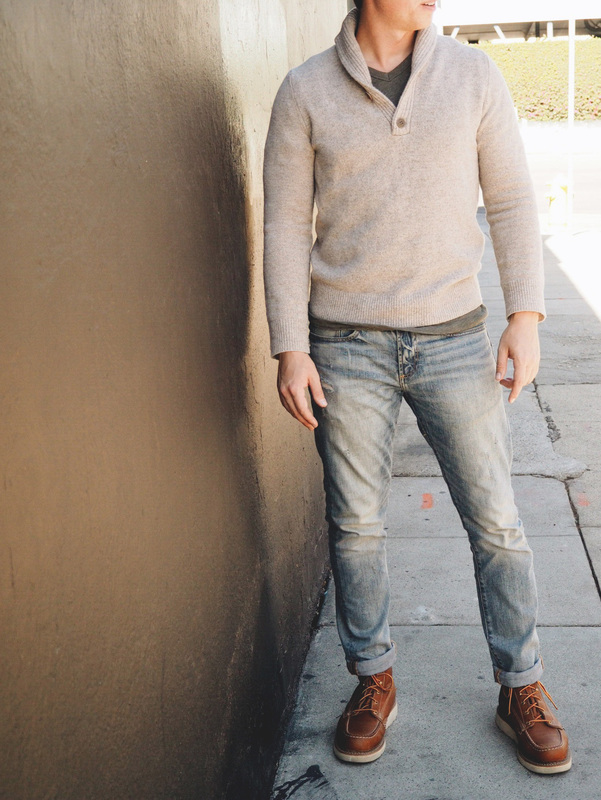 The reason a sweater like this is so great is, while it's pretty minimalist in its style (no ornate knitting or patterns), the thicker, rolled neck with the 2 button placket adds a level of sophistication and intentionality a standard crew neck can't possibly achieve on its own. 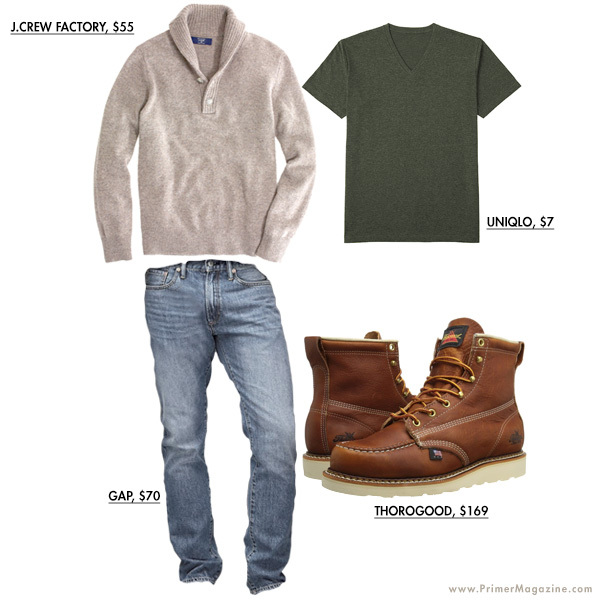 Paired with a complementary green v-neck tee and moc-toe boots creates a decidedly casual Getup that'll still have you dressed better than 90% of the schleps at your destination. An outfit like this is a perfect fall uniform. Invited to a friend of a friend's party or a bar you're unsure of the ‘fanciness' of? 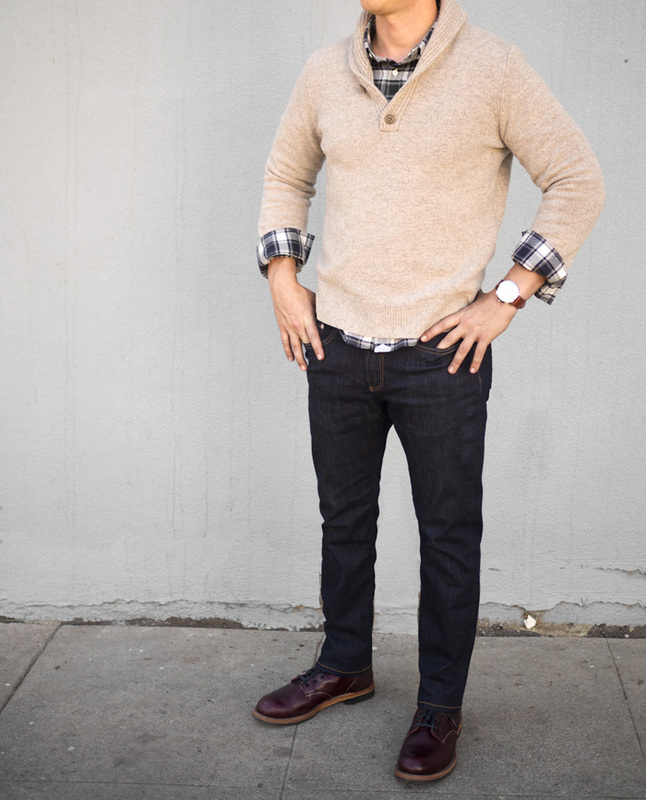 Our sweater dressed up with a plaid shirt, dark selvedge denim, and our beautiful blackcherry Red Wing Beckmans will never steer you wrong. 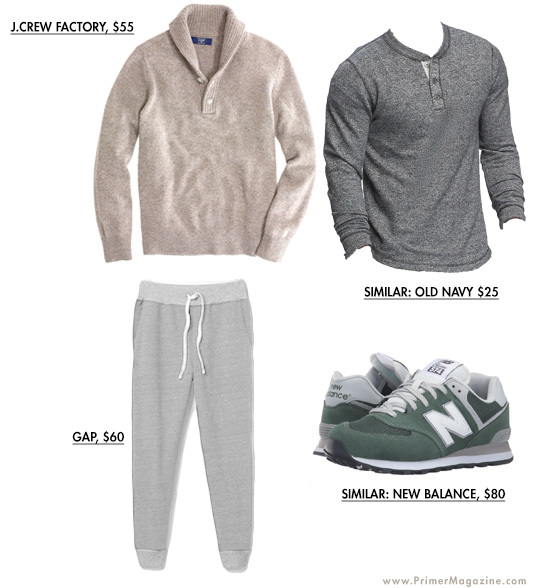 The introduction of uber casual elements like workout pants and designer athletic sneakers is now well-established in the world of men's fashion. Half of men rejoice, excited to include the sleeker, more minimalist styles and gain comfortability. 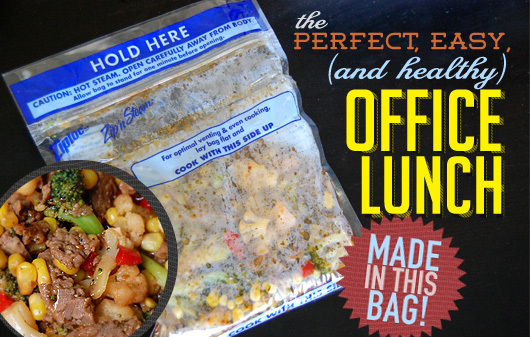 The other half shun it as lazy. But it doesn't have to be either-or. Adding our sweater and henley takes these sweatpants from “rolled out of bed this way” to an intentional weekend outfit for donning on your more casual days off. Simply swap in your denim when it's time to head out in the evening. This a really great versatile “dressed up” outfit. 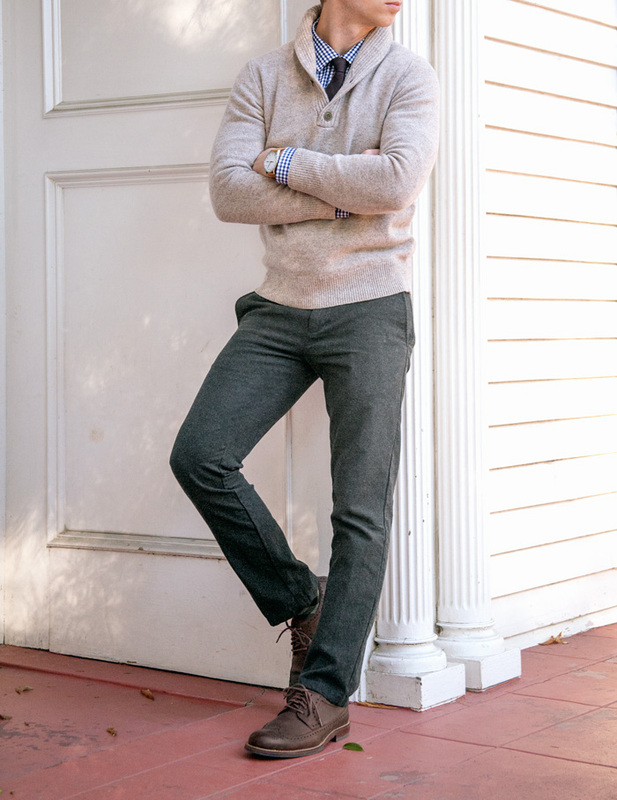 It's flexible, because while it has dress pants, dress shoes, and a tie, we've replaced a blazer with our lambswool sweater, making it an easy go-to when you're not sure how dressed up to be. Trying to figure out what to wear to the company holiday party? This is it. I'd love to hear what you think! Please share and chat with me in the comments! I’ve got a similar one from Ralph Lauren off EBay. I really like wearing it with an Oxford https://uploads.disquscdn.com/images/933e911909427d3ba19ad736f9983055e8a921b4185360f9da691146eb6e6dfd.jpg shirt or a Henley. I thought so, I really like the selvedge line Uniqlo put out. And it’s very accessible. Do you know any good shipping services to the U.K? I’m really thinking of getting that sweater but I can’t as J Crew Factory don’t ship to me. How do Uniqlo slim jeans fit compared to Levi’s 511? Also, I really like the *idea* of “athleisure” but I’ve never seen it executed in a way that I really liked. I’be tried both and the Uniqlo ones feel like skinny jeans to me if I take my actual size. So I normally size up one in the waist for Uniqlo jeans. Love that article! Exactly what I was looking for as the weather cools down and I could use tips for different outfits.. Other than the super-casual I can see myself in all these different setups, thanks! 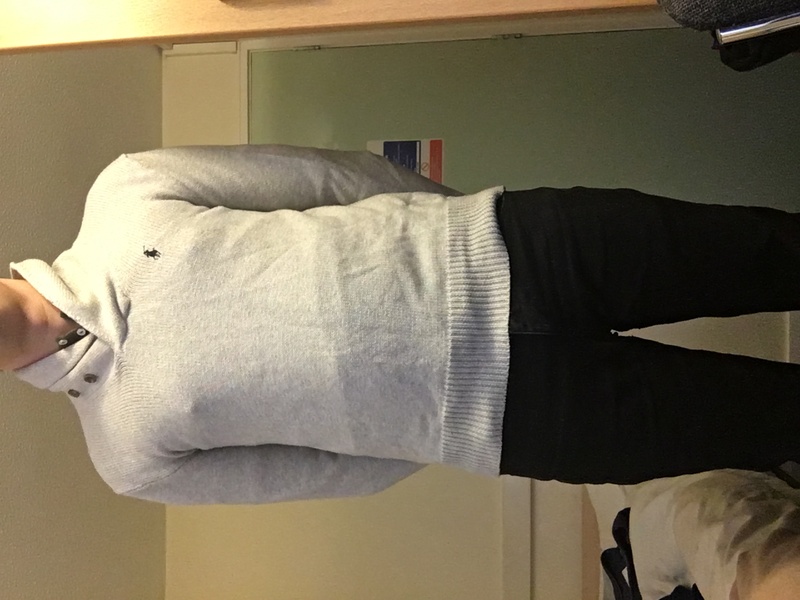 How do you deal with the lambswool against your skin with a t-shirt underneath? I have a similar (might be the same sweater) in Navy, but I always have to go long sleeved to keep the itch away. You could give cotton a try? They’re normally a bit cheaper and no itchy skin. This one in particular doesn’t bother me, I always have some sort of shirt on underneath. Is that the pebble color? I believe it is, but it isn’t as bright in person, more of a subdued mix of that and the heather mink color. I have this sweater, it’s fantastic. Don’t think I’d rock it with sweatpants, but with a button-down and jeans there’s nothing better. I have to say I HATE the Athliesure look…i think it is just sloppy and a weird pairing of dressy/casual and REALLY casual attire. 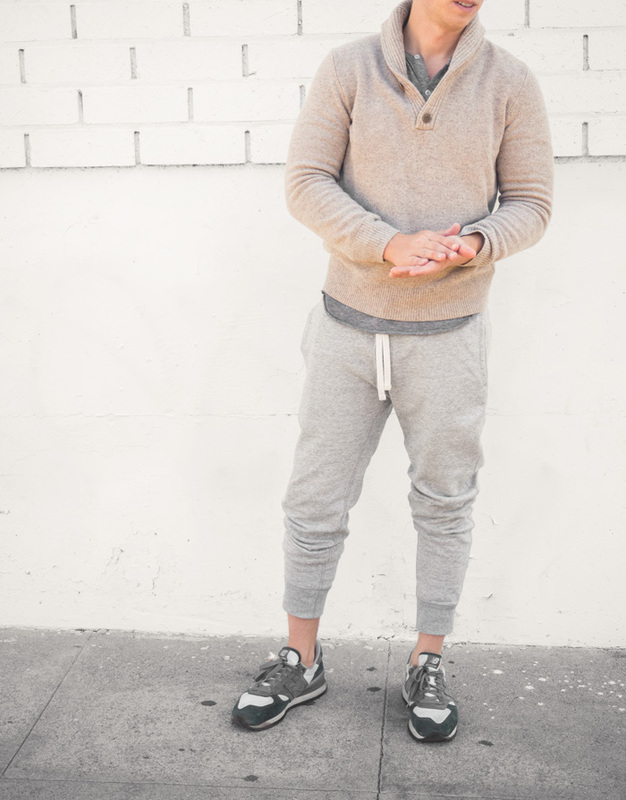 If you are going to wear sweat pants or cotton joggers pair it with a sweatshirt or hoodie! 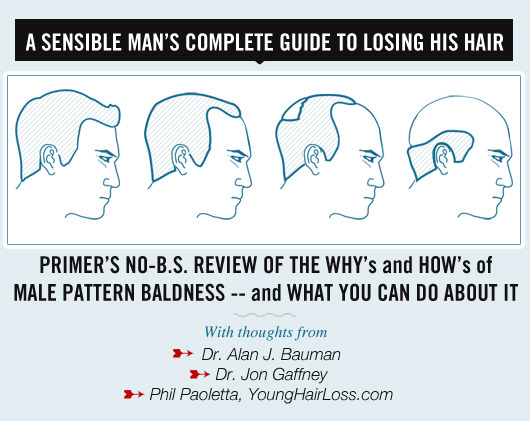 Ok, rant over – The other three looks are great! The henley from the Athleisure look would work with the first look as well. And if you’re capable of sewing a couple buttons a pair of brown leather buttons make good replacements and up the class of this sweater a bit. I hate the whole athleisure concept with a passion… Apart from that I think the other three looks are very well put together, specially the dressy look. I wouldn’t pay $50 for a pair of Uniqlo jeans when I can get a pair of Levi’s for $30-$40. I couldn’t care less about selvedge jeans, to be honest. It’s a concept that has been sold to us by fashion magazines and it’s supposed to be very cool when in real life no one around you cares. Great stuff as always Andrew. As a poor college student who needs a couple of henley shirts, what two would be the most versatile? Long/short sleeve? and what colors? Also, for a reference is there a way to list what sizes you bought compared to your height/weight? A lot of these places are online and it’d be awesome to have that a reference! Most versatile for sure would be white and gray. Next would be green, blue, or black. Short sleeve can be worn year round, but I have several long sleeve as well.